The participants of the seminar gain a basic knowledge about trauma, different reactions to pressure and how people can deal with it. It also discusses what drug consumption plays a role in this context. Two speakers (emergency psychologists and experts from forum addiction) elaborate in groups up to 20 participants the above-mentioned topics with interactive methods to ease the contact to the persons admitted to the centres. The two-day seminar is offered in German and Italian. The Italian seminars were already started in summer, the German seminars start in September 2018 (Brixen: 19.09.2018 and 28.11.2018; Meran: 26.09.2018 and 05.12.2018 – changes reserved). In the frame of our EU-project “Click for Support – REALized” the web-based intervention “Mind Your Trip” is launched online and in Apple- and Android app stores. The web-based intervention will be available in 10 languages (DE, FR, FI, GR, LV, LU, NL, PT, SI, SK) and focuses on young consumers of New Psychoactive Substances (also known as “designer drugs”, “synthetic drugs or “legal highs”) between 14 and 25 years. Mind Your Trip provides information, a self-assessment test and three intervention modules: “Brief intervention”, “Safer Use” and “Quit or Reduce”. The intervention is anonymous and free-of-charge, and is professionally conducted by trained prevention experts. The programme will be available until at least October 2018 and will be operated by the 13 euro net project partner organisations. The results of the evaluation of Mind Your Trip will be presented at the projects’ Final Conference in Münster, Germany in November 2018. Tarragona will host on April 17 and 18 this conference that aims to publicize Planet Youth: a community program for drug prevention started in Iceland in 1998 that has shown excellent results in the decline of alcohol, cannabis and tobacco consumption among the teenagers. Planet Youth is a program based on scientific evidence, universal and community prevention that has drastically reduced the consumption of drugs in the youth population through political commitment and the continued commitment to create healthy and quality environments for all citizens. Aula Magna Campus Catalunya (Av. Catalunya, 35). Tarragona, Spain. Organized by: Council of Tarragona and Icelandic Center for Social Research and Analyzes (ICSRA). Collaborators: Smart Mediterranean City Foundation, Rovira i Virgili University and Reykjavik City Hall. The school was honored by the Austrian euro net member Institut Suchtprävention for its special engagement in the field of peer education. Since the beginning of the school’s peer project in 1997, they have trained on average 6 pupils each year. The training has been implemented in cooperation with the Institut Suchtprävention. Its main focus is addiction prevention. The peer project has been initiated by Ms. Dipl. Päd. Ilse Surenjan. As a result of her engagement, the peer project is still active at the HBLW Linz. 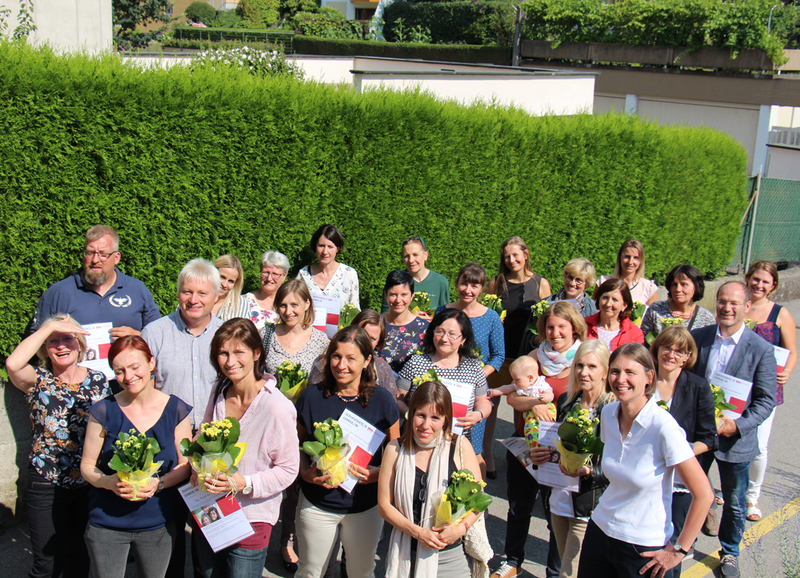 Last month, Ms. Surenjan celebrated her retirement and was surprised with special guests: former peers and the director of Institut Suchtprävention Christoph Lagemann expressed their gratitude. They appreciated her exemplary commitment as the coordinator of the peer project for more than two decades. Background: Within the peer project, selected pupils of 9th and 10th grade are getting trained in the field of addiction prevention. After this training, they are sharing their experiences and their know-how with their classmates – not as “young teachers” but through their attitude and behaviour in class, at events and simply when spending time together. From this spring on, the Institut Suchtprävention offers the program “strengthening families”, for families, going through a challenging stage – puberty. It is a time with several changes. What worked in cohabitation yesterday, might not work today. Conflicts in the family increase and often the whole family comes in situations, where it is difficult to talk. “Strengthen families” is a program that supports families in these situations. The family spends time together in a pleasant environment. “Strengthening families” will be conducted by prevention experts, it includes films, games, practical exercises and discussions. Parents learn what it means for their children to come of age, what they feel, what they think and how they act. As well they learn how to find common solutions for familiar problems and –at the same time- express love and appreciation. One of the main topics is how to counteract smoking, alcohol- and drugs consumption. The adolescents learn how to cope with stress and problems, how to show and share their feelings and needs, how to resolve conflicts, how to build up and care for friendships. “Strengthening families” is addressed to families with at least one child between 10 and 14 years. Invited to the program are the children at this age and the person, responsible for their education. “Strengthening families” is evaluated on international level. It consists of 11 meetings, each for 3 hours, and ends with a joint dinner. “Strengthening families” was developed at the Iowa State University, USA. The “Deutsches Zentrum für Suchtfragen des Kinder- und Jugendalters”, Hamburg translated, adapted and evaluated the program for the German-speaking area. The next euro net network conference takes place in Münster, Germany on 12. March 2018. One of the main issues will be the discussion about experiences and good practices for parental work. Within the personal development of young people, parents have got an important role. Nevertheless: Parents and Adolescents face a challenge in the phase of puberty. There are commonly conflicts between Adolescents and parents. Part of these conflicts can be the consumption of substances like alcohol or cannabis or the (problematic) dealing with handy, gaming or gambling. The discussion is about experiences, methods and tools for the work with parents of experimenting young people (selective prevention). One of euro net’s EU-project is “Localize It!”. “Localize It!” aims at strengthening municipalities in their capacity to reduce underage and heavy episodic drinking. Coordinated and custom-fit local alcohol strategies will be developed, implemented and evaluated. The next project event is a European Expert Meeting in Muenster, Germany, on 13-14 March 2018, good practices for alcohol prevention for young people in seven defined settings will be discussed. The program of this European meeting is highly diverse: Speaker from different countries of the European Union talk about their experiences in the cooperation with municipalities in the field of alcohol prevention. Gregor Burkhart from EMCDDA gives an overview about behavioral and structural prevention in EU member states. The participants get more information about “STAD Europe – communities preventing alcohol – related harm” (Trimbos Institute, Netherlands). A presentation and discussion of good practice models and a market of opportunities complete this meeting. The European Expert meeting is open for all experts, who work in the field of addiction prevention or are interested in this theme. To registrate for the conference, please contact the project coordination via email: rebekka.steffens@lwl.org. Please note that places for the conference are limited!